By the end of yesterday's US election, liberals were tearing out their hair and conservatives were doing the happy dance at the GOP victory. In my mind, the Republicans as a whole are every bit as much welfare-warfare statists as the Democrats, but certainly the current round of "throwing the bums out" and replacing them with fresh bums is a reflection on American dissatisfaction with the past two years of rulership. Transiting Jupiter is trine the US Chiron (pain made public). Transiting Chiron is conjunct the progressed US Sun and Pallas (an attempt to adjust/heal both the nation and the state of its ethics). 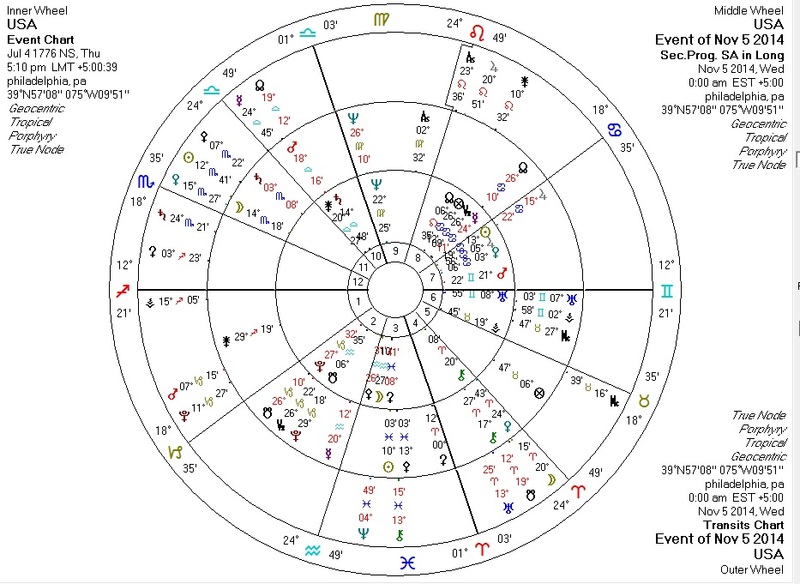 Transiting Saturn trine US Mercury: the US voice made solid. Transiting Uranus tightly square US Sun: a significant shakeup. Transiting Neptune trine US Venus, ruling the Tenth House: the dissolving of structure. Transiting Pluto continues its long opposition to the US Sun, suggestive of continuing shifts in power. Sweet, sweet gridlock, come quickly!